It takes all kinds to make a world, and it takes all kinds of vehicles to make the unbeatable lineup of 2019 Jeeps. For those who want the capability, performance and great styling Jeep is known for in a beautiful, mid-sized package, check out the 2019 Jeep Compass! Starting at just $21,595, the 2019 Jeep Compass blends legendary Jeep capability with modern Jeep styling, at a price you can afford! If you’re looking to buy a 2019 Jeep Compass in Fayetteville, Arkansas, stop in today at McLarty Daniel Chrysler Dodge Jeep Ram Fiat of Springdale, where our selection, service and deals will make you a customer for life! 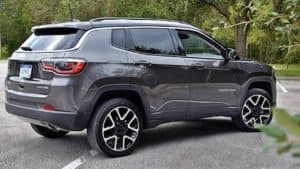 Drawing on a lot of the same the heritage-inspired details that make the 2019 Jeep Cherokee an instant classic, the 2019 Jeep Compass has “baby Cherokee” looks and all the capability of its big brother, while striking a bold, modern tone all its own.. Starting up front with a tasteful take on the classic seven-slot grille that’s been a hallmark of Jeep design for decades, the 2019 Jeep Compass is as eye-catching as it is unique, especially with the available two-tone gloss black roof and dual-pane panoramic sunroof. Choose from any of four beautiful alloy wheel styles, in diameters from 17 to 19 inches. In the rear, the steeply-canted rear hatch allows for easy loading and unloading at the touch of a button. Inside the 2019 Jeep Compass interior can be configured to meet your needs, from the no nonsense comfort of the base-level Sport, to the ultimate luxury of the premium Altitude, to the hose-it-out stain resistance (or, if you prefer, premium leather) of the trail-rated 2019 Jeep Compass Trailhawk. Make that interior as loud as you want it with the available BeatsAudio Premium Sound System, with nine speakers, a subwoofer, and 12-channel amplifier. The name Jeep is synonymous with unstoppable capability, and that includes the smaller-but mighty 2019 Jeep Compass. Get out there and find your own adventure with the available Selec-Terrain Traction Management system, which can optimize engine and drivetrain components at the touch of a switch for conditions including Snow, Sand, Mud or Rock. Keep going when the going gets touch with the 2019 Jeep Compass Trailhawk’s Active Drive Low 4×4 System, which features unstoppable Jeep off-road capability put the ability to automatically disconnect the rear axle, switching effortlessly between 4×4 and 4×2 when traction demands are low. That boosts fuel economy by limiting parasitic power loss. Torque and horsepower are key, whether you’re heading off road or fighting your way through the Urban Jungle, and the 2019 Jeep Compass has your back there, too, with the 2.4-liter Tigershark Multi-Air 2 four cylinder. With a combination of cutting edge fuel and combustion management, the 2.4-liter Tigershark is small but mighty, too, delivering a robust 180 horsepower and 175 lb.-ft. of torque, for towing of up to 2,000 pounds when properly equipped plus fuel mileage of 32 miles per gallon on the highway. Heard what you need to hear to know you’re ready to buy a 2019 Jeep Compass in Fayetteville, Arkansas? 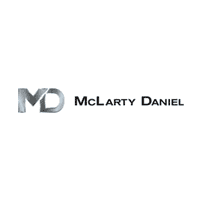 Then stop in today at McLarty Daniel CDJRF in Springdale! We’ve got the 2019 Jeep Compass in all trim level and option packages, and with more arriving daily, we’re sure to have one that meets your needs and your budget. Stop in today for a test drive, or shop our big selection online right now!